An architect for a work site has denied reports by union reps that asbestos was discovered at the Darwin work site. The four-storey Paspaley Building has been under demolition for the last few weeks in preparation for building the 18 or 20-storey Charles Darwin Centre on the corner of Smith and Bennett streets. The building’s height has not yet been determined. Chief Minister Adam Giles had planned a staged media walk-through of the site for lunchtime, but cancelled it at 11.25am. Officials from the Construction, Forestry, Mining and Energy Union said they took samples from the site at 8am today and sent them for laboratory examination this morning, which they said identified them as chrysotile, or “white asbestos”. But building architect Ross Connolly said Worksafe NT has declared the site safe and that the union was “stirring the pot”. “They allegedly discovered some asbestos sheet,” he said. He said the material found was harmless cellulose fibre cement. 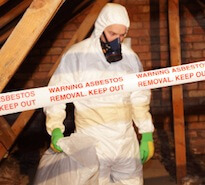 “Worksafe has confirmed that the material found was not asbestos,” he said. Worksafe has been contacted for comment. He said the site had been certified asbestos-free by a certified removalist who removed asbestos from the remains of the three buildings about four or five weeks ago. 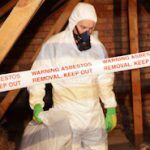 “Clearly when you do an asbestos register there’s always the risk that there might be some asbestos that might be not evident at the time the register was prepared,” he said. “The contract for the removal makes it incumbent on the operator to obviously deal with anything that turns up in the removal process. He said there was protocol for any asbestos discovery by workers, and that no reports had been made by workers to the site manager. Mr Connolly has said work has resumed, but the union has said the site was shut. CFMEU assistant secretary Jade Ingham said the site was “riddled” with asbestos. “I can tell you we’ve better things to do than stir the pot and turn up on sites,” he said. “If they were resolute why did they shut the site?” CFMEU official Ben Laokes said they found 10cm x 10cm sheets of material on the site. “The document provided to us saying the asbestos was removed but then you walk through and see sheeting everywhere,” he said. “It didn’t take us long to find it. We took four steps into the site and we found it. It’s all broken up. Asbestos was used as a fire retardant building material until it was banned in 1989 because of health risks from inhaling asbestos fibres. The Paspaley Building is understood to have been built in the early 1980s or earlier.